72 hour cancellation notice must be given, otherwise the first night's deposit will be taken. 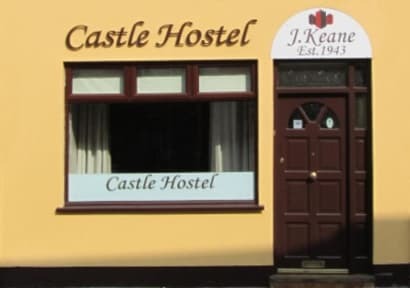 Castle Hostel is situated in the heart of Tralee's town centre. The hostel is run by Aileen,Stephen & family and is renowned for it's comfort levels, popular with visitors and looks likely to continue attracting the tourists for many years to come. With 8 en-suite rooms, three of which are doubles, one single, three of them sleeps four people, and the other room sleeps eight. Four of them have televisions and all are centrally heated. There is a fully equipped kitchen, a communal dining and lounge area with television where a free continental breakfast is available each morning, free Wi-Fi available throughout the hostel including bedrooms, free luggage lockers and bike lock up facility. Outdoor smoking area. Internet cafe next door and launderette across the road. With the town of Tralee right on the hostel's doorstep, there are plenty of other exciting facilities close by. Minutes walk to Kerry County Museum, Tralee Town Park, Tralee Bay Wetlands Centre, Aqua Dome, Aqua Golf,Tennis Court. 2km canal walk to Blennerville Windmill. We are ideally located to cater for those intending to walk the Dingle Way.Atlantic Way, and Camino Way. Our hostel is the perfect place from which to launch your assault on the Dingle Way and Camino Way to recuperate after completing same !! Being centrally located also ensures that our guests have easy access to all events on the streets of Tralee for our Internationally renowned Rose of Tralee Festival which takes place annually in August . Rose of Tralee Festival 2019 commences on the 23rd August / 27th August incl. Open all year, you can be rest assured of an enjoyable trip to Tralee where you will stay in a comfortable, friendly, warm and welcoming establishment.
. Free Towels, Linen, Duvets. All groups / parties welcome. I had a pleasant stay at Castle Hostel. The staff is really nice and able to help you whenever you need it. Rooms are clean and comfortable and so is the toilet. Lockers are available. Highly recommended. Ottimo ostello, pulito e comodo. In pieno centro a Tra Lee, cittadina molto carina e molto irlandese! Assolutamente consigliato! It was fantastic to stay at Castle Hostel. It's next by the centre and all the good pubs. The staff is really friendly and we also had a delicious Irish breakfast cooked by the owner to make us feel at home. Posizione eccellente, personale molto gentile e disponibile, camera pulita e accogliente anche se piccola. Unica pecca la connessione e wifi "ballerina e debole" forse per la posizione della camera al piano alto. Non posso recensire la colazione perché siamo partiti all'alba... ma devo dire che la cucina era ben attrezzata e pulita. Consigliato vivamente anche per la tranquillità.